Produces wilt-free petals that reach up to 8" across and come in a variety of rich colors. 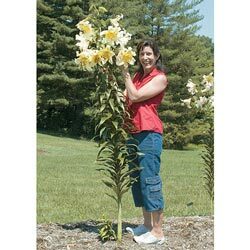 These 4-6' tall beauties reach 3 1/2 to 5' the first season and rocket to their full height of 6' the following season. Midsummer blooms are excellent for naturalized areas, cottage gardens, flower arrangements and borders. Foliage Type: Stems are usually unbranched with dark green, lance shaped leaves whorled or spirled up the stems. Flower Form: Out facing, pendant flowers with thick waxy petals. 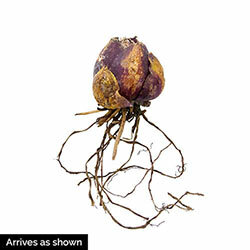 Planting Instructions: The bulbs should be planted at least 6" below the soil surface. Pruning: Cut back stems by 1/3. After flowering. Winter Care: Zone 4 should apply several inches of mulch for winter protection. 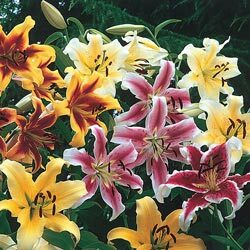 Additional Information: Division VIII lilies. Cross of Trumpet lilies and Oriental lilies.